June 23 - On the way to Leadville I drove to Summit Lake at 12,800 ft and climbed 14,264 ft Mt. Evans by the class 3 NE ridge, then circled the ridgeline clockwise for a time of 1 hour up, 2 hours down. To prevent an altitude headache I drank 1/2 gallon of water before starting and 2 20 ounce bottles during the hike. June 24 - Climbed La Plata (14,336 ft) from Winfield (10,000 ft) with Steve and Deb Pero in 3:30 up, 2:30 down. Winfield is a ghost town at mile 50 of the Leadville 100 course. June 25 - climbed Elbert (14,440 ft) from the Halfmoon trailhead (10,050 ft) in 2:21 up, 20 minutes at summit, 1:40 down. The 4.5 mile climb was at a hard effort to test my acclimation. Mt. Elbert is Colorado's highest (and most popular) mountain. There is usually a big party at the summit, climbers passing around a bottle of whiskey or calling on their cellphones "Hello, I'm on Elbert". The trailhead is 14 miles from Leadville. June 26 - climbed Sherman (14,036 ft) from Iowa Gulch (11,900 ft, 6 miles from Leadville) in 2:00 up, 0:45 down. June 27 - attempted to climb Mt. Yale (14,196 ft) from Avalanche Gulch (9300 ft) by the east ridge with Steve and Deb Pero. A storm approached so we turned around at 13,080 ft on the exposed ridge and took a shortcut back through open woods to pick up the trail at about 10,000 ft. We saw 2 newborn baby deer. Time: 5 hours. June 28 - attempted to climb Mt. Massive (14,421 ft) from Halfmoon (10,050 ft) by the new trail on the west side, but by 8:30 AM there was sleet so I turned back. Time: 2:40. 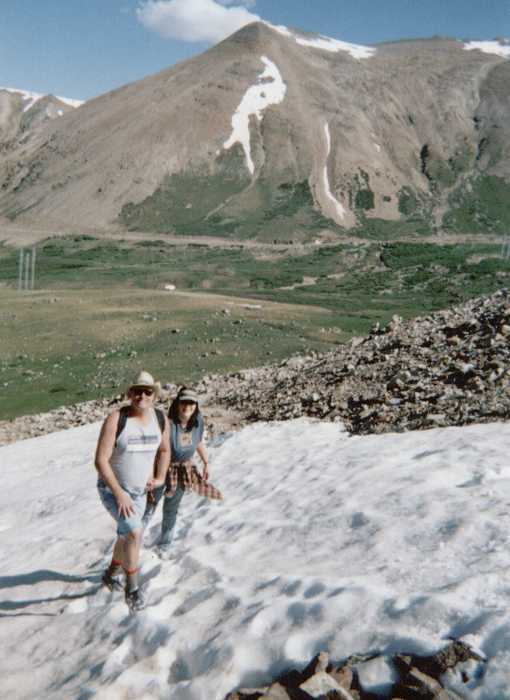 June 29 - climbed Sherman again with Pete and Carol (below), who were staying at the hostel. This was their first fourteener so we took it easy (5 hours). Pete and Carol starting up Sherman. We parked at the road on the other side of the meadow at 11,900 ft. The Sherman trail is mostly talus with some snow patches. June 30 - easy day, walk 4 miles. 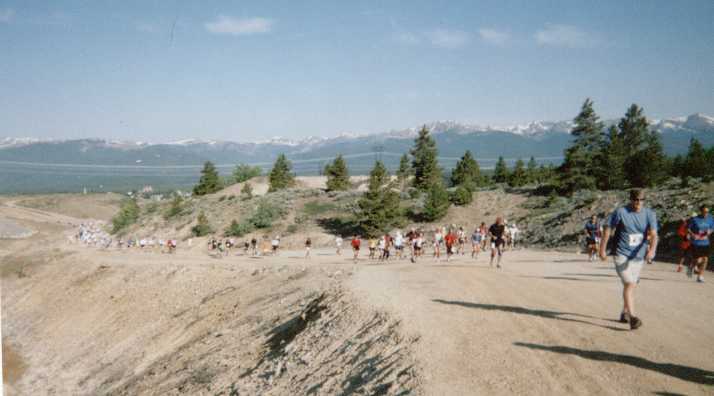 July 1 - Leadville marathon. 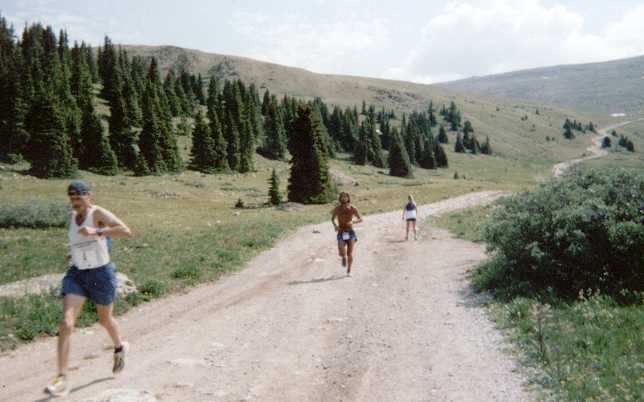 The race starts downtown at 10,150 ft, climbs to Mosquito Pass at 13,150 ft and returns. There are many hills in between. Total climb is 6600 ft (and 6600 ft descent). I finished 90'th out of 238 finishers in 5:45:00. My splits were 3:07 up and 2:38 down. 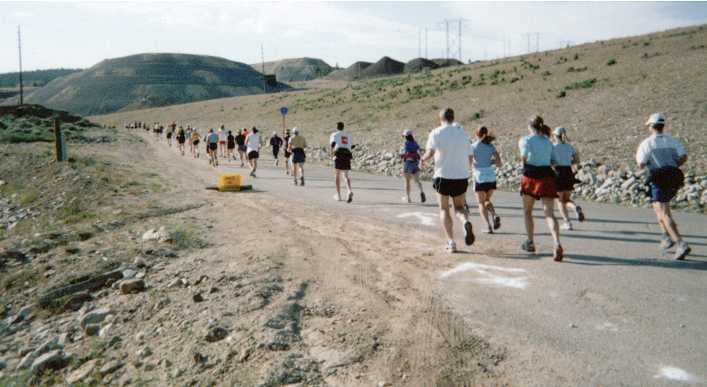 The Leadville marathon heads east of town into the old mining district. The climbing is gentle at first. As we ascend, the roads get rougher and steeper. Here the grade approaches 30%. 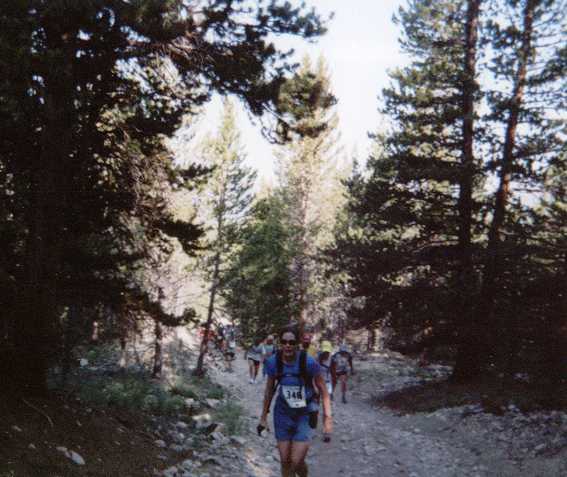 Paul Koch leads the field just below treeline (11,800 ft) after returning from 13,150 ft Mosquito Pass, with Anton Krupicka only seconds back. Krupicka won in 3:41:04 followed by Koch in second place at 3:50:44. Results. July 2 - My legs were not sore after the marathon so I climbed Elbert, 2:25 up, 1:40 down. My time was about the same as before but the effort felt much easier. I was not breathing nearly as hard. July 3 - I tried again to climb Mt. Massive by the new trail on the west side, but I missed the trail and ended up in a basin at 13,000 ft surrounded by steep cliffs and rockslides with bad weather approaching, so I turned around. Time: 5 hours. July 4 - ran the Leadville Firecracker 5K in 22:20 (about 2:30 slower than sea level), finishing 15'th out of 75 runners. July 5 - climbed Mt. Harvard (14,420 ft) and Columbia (14,073 ft). I started at about 8500 ft about 2 miles east of the Harvard Lakes trailhead or 3.5 miles east of the N. Cottonwood trailhead because my rental car would not go any further on the rough road, which has gotten worse over the years. I started at 6:05 AM, summitted Harvard via the Horn Fork trail at 10:05 AM, descended to 12,600 ft into Frenchman Creek basin on grassy slopes, summitted Columbia at 12:40 PM, then descended the SE ridge. There is no trail on the descent. The route is a long, rocky ridgeline until treeline, then it becomes a bushwack down 50% grades until you reach the Colorado trail at 10,000 ft which descends back to the jeep road. I finished in pounding rain and lightning at 3:45 PM. I never did meet up with my planned hiking partners, who started 40 minutes earlier, until after the hike was over. Total: 20 miles in 9:40. July 6 - easy day, walk 4 miles. 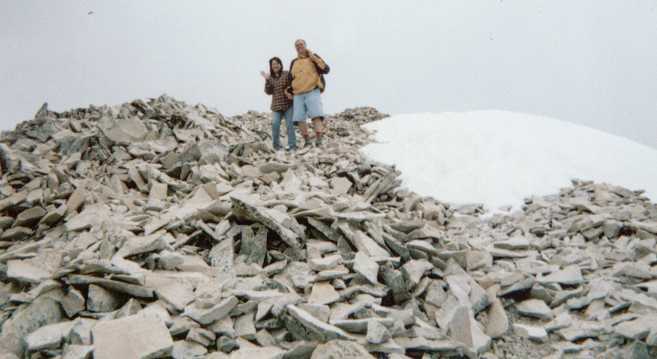 July 7 - climbed Elbert in a hard effort, 2:00 up, 0:30 on summit, 1:04 down. July 8 - rained all day, once again foiling my plans to climb Massive. July 9 - Copper Mountain Marathon in 4:49:00, 10'th out of 13 finishers. The race started at Copper Mt. ski resort about 20 miles north of Leadville at 9700 ft. The first 6 miles climbed along paved bike path to Vail Pass at 10,900 ft, then peaked at 11,200 ft at mile 8 on smooth dirt road over Shrine Pass. It continued on the rarely travelled dirt road through remote forest down to 9500 ft at the turnaround and returned. We had rain and sleet returning over the pass at mile 20, then rain to the finish. The first two runners tied in 3:35. One of the two said his marathon PR was 2:37. I guess that's about right because my time was almost 90 minutes slower than my sea level PR. 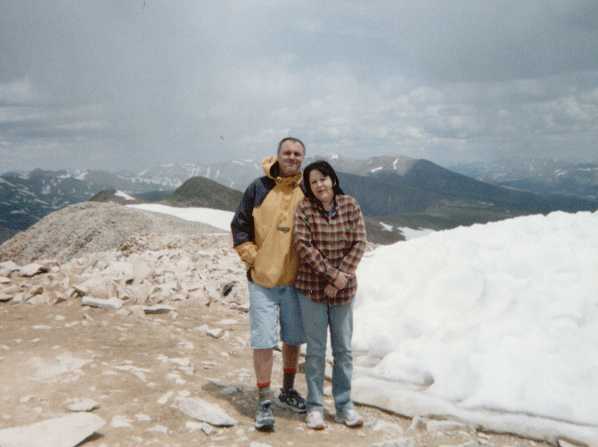 July 10 - Once again my legs were not tired so I climbed Elbert at an easy effort, 2:40 up, 1:50 down. July 11 - My fourth attempt at Massive was once again spoiled by storms at 12,500 ft. Time: 4 hours (about 10-12 miles). July 12 - I started my 2 day taper for Hardrock by driving to Silverton. July 13 - Another rest day. I camped at S. Mineral campgrounds 3 miles from town. July 14 - Hardrock 100 did not go as planned.